This has been a very busy month for Chim and the ministry. From the APL England, we reconnected with the chief cook, Ramchandra (a Hindu convert) and the mess man, Melvin. They came to our home for dinner, fellowship and prayer. We shared the Goospel with mel. He shed many tears of repentance and he prayed the sinner's prayer. (The same day he met with Jac-who also works with seafarers-and he prayed with him as well.) Mel committe his life to the Lord at that time. He's from Goa and has a Catholic background. Both men will be back soon on their return voyage. Ramchandra has requested prayer for his family. They have been experiencing a lot of difficulty from the rest of the family because of their conversion. In fact, his brother actually tried to set Ram's house on fire while he and his family were sleeping inside! Captain De Mallow and his wife from MOL Paradise returned and we spend 3 days taking them shopping and around the area at their request. They were comfortagle enought with us that they shared some of their family problems and we prayed for them. They also mentioned a crew member who had been suffering chest pains while at sea and upon their arrival in port he was admitted to Long Beach Memorial hospital. Jugdesh Rawat was on the verge of having a heart attach but a stent was successfully implanted the same day President Clint had his 2 stents done! Chim phoned Jugdesh's wife in India letting her know of his condition and gave her reassurance that he was recovering well. The ship left Jugdesh behind so Chim continued to visit him daily until his release. We invited him to come to our house during his recovery but the ship's agent required him to stay at a local hotel. 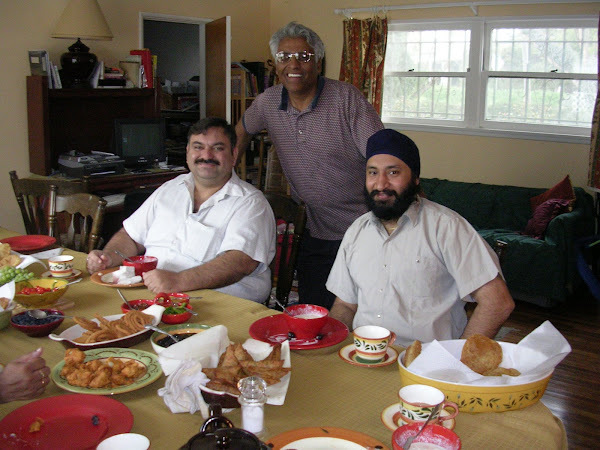 Chim picked him up each morning and we had him at our home for lunch and dinner daily until he flew home to India. He later called Chim to let him know he arrived safely.